‘Bim’s Passion’ is made in memory of my lovely late great aunt Bim. 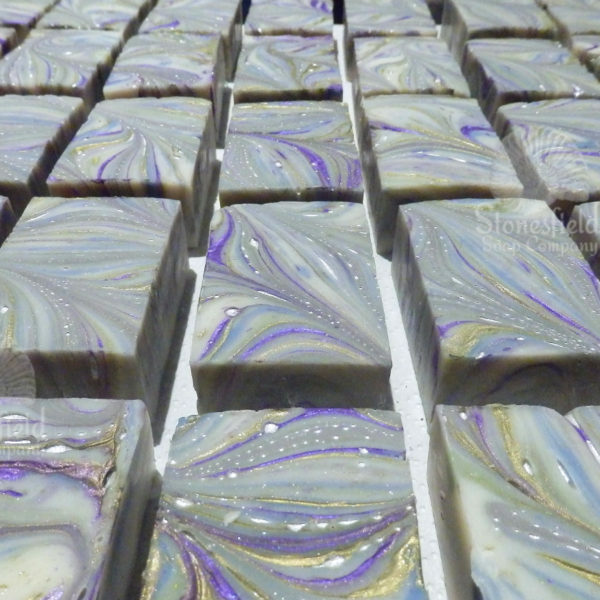 She adored lavender so that wonderful essential oil headlines this soap. 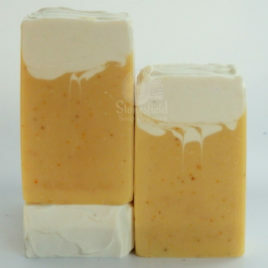 It is supported by essential oils of bergamot, cedarwood and rose geranium. 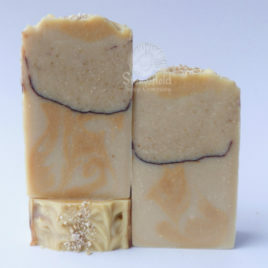 It contains shea and cocoa butters as well as wonderful hemp seed and wheatgerm oils, Tussah silk, goat milk, as well as lots of other goodies. 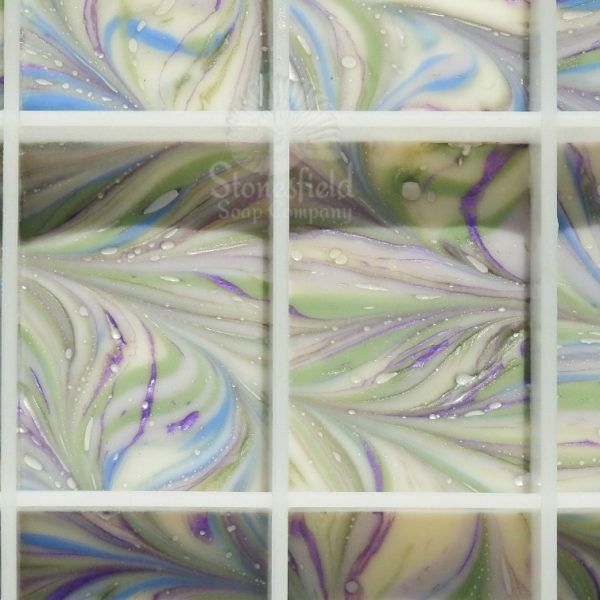 We use the glycerine mica swirl method on the surface this one – can you see the trails of tiny silver dots? I love it! The design will vary slightly from bar to bar. Sodium olivate, Sodium cocoate, Glycerine, Aqua, Sodium sunflowerate, Sodium sheabutterate, Sodium cocoabutterate, Caprae lac (goat milk), Lavendula angustifolia* (Lavender) oil, Cocos nucifera milk, Sodium castorate, Sodium hempseedate, Triticum vulgare germ oil, Cedrus deodar* (Cedarwood) wood oil, Citrus bergamia* (Bergamot) oil, Pelargonium graveolens* (Rose geranium) oil, Lavendula angustifolia flowers, Manihot esculenta starch, Spirulina planifolia, Sucrose, Tussah silk, mica, nature-identical mineral colours: ci77007, ci77289. All mineral pigments we use are laboratory-purified, nature-identical oxides, hydroxides and ultramarines. Legislation now prohibits (thankfully) the use of mined sources of these minerals as they may contain harmful contaminants such as arsenic and toxic heavy metals. The mineral pigments we use have exactly the same chemical formula as the mined version, but are 100% pure, non-irritating and thus totally safe for cosmetic use; EU labelling directives requires that each one be be listed according to a specific universally acknowledged code number, the ‘ci number’. 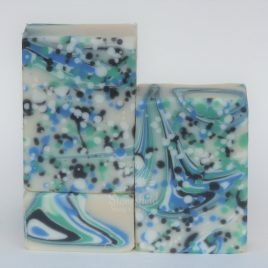 The blend of essential oils in this soap is truly stunning, I am not a lavender or a cedarwood fan however this soap is blended to perfection……my husband loved this soap too. 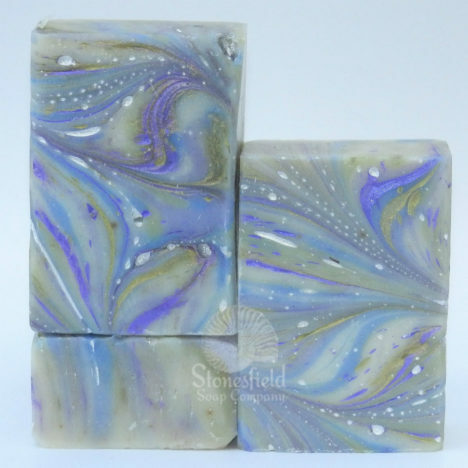 As with all of the soap that i have had from Stonesfield, the quality has been superior and outstanding and the ingredients are stunning. Thank you for your feedback. 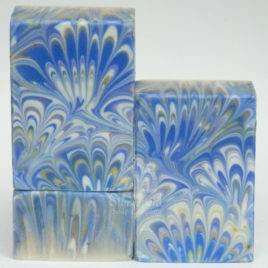 We are so pleased that you like our soaps.